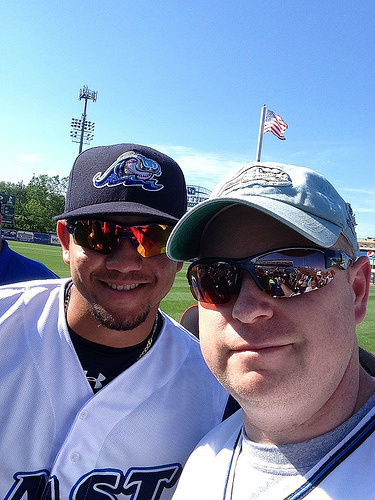 Betancourt and I at the MWL All-Star game in 2014. Now he’s with the Brewers. 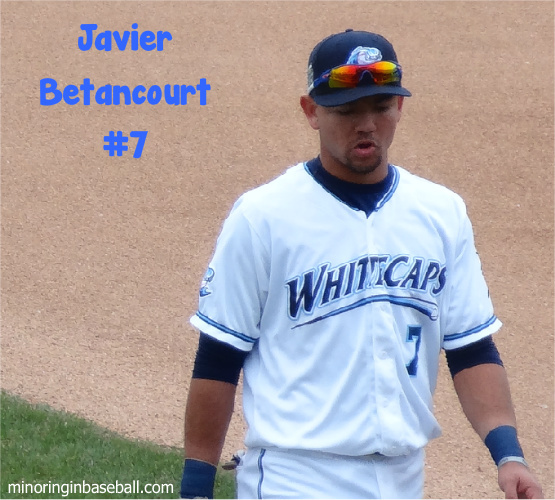 Well, this is like Deja Vu all over again, as the Detroit Tigers organization has traded away one of my favorite prospects and former West Michigan Whitecap Javier Betancourt. I went through this a year ago when the Tigers shipped Devon Travis off to Toronto for Anthony Gose. 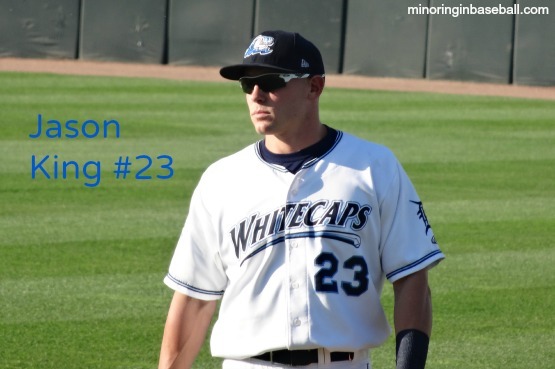 I know this is a business, and the organization is making deals to better itself and be competitive for the 2016 season, but I’ve seen many of my favorite Whitecaps get traded away over the years. 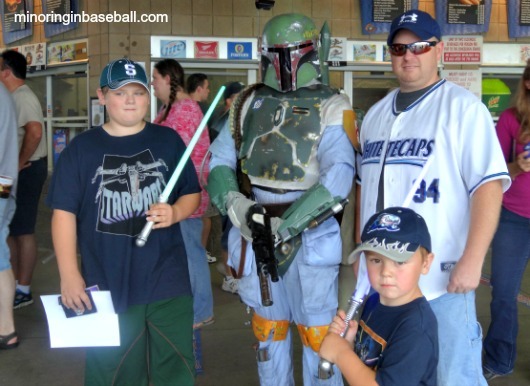 As a fan, it’s simply easier to invest in players that you’ve met and seen play live many times. Also, as a former second-baseman myself, they tend to be my favorites to track up through the system. 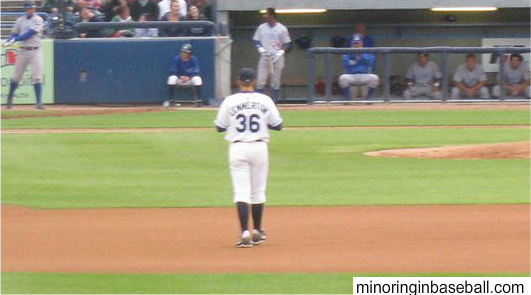 Players like Scott Sizemore, Justin Henry, Brandon Douglas, Betancourt, and most recently Joey Pankake, have patrolled second base at Fifth Third Ballpark, and I’d hope to see do the same at Comerica Park in TV. Sizemore had his chance, but was dealt after the fact, and many don’t even make it that far. Henry has come back to the organization as a scout, so I guess that could be considered a victory, right? The 6’3″ hurler certainly has the stuff to back that up. His fast ball hits up to 95 mph, and he has a nasty curve/slider combo that has made minor league batters look just silly. The Tigers look to be using Knebel to help out the depleted bullpen that has been overworked this past week. 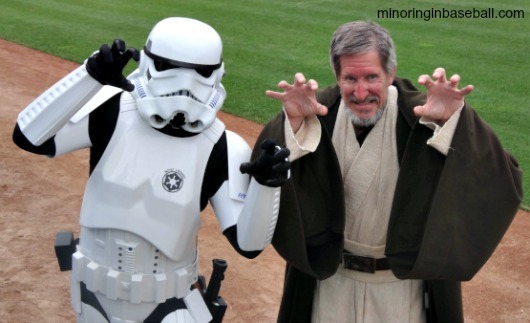 He was available to pitch in last nights’ game against the Rangers, but got no further that some warm-up pitches in the ninth inning. Tigers’ manager Brad Ausmus looks to be giving him a chance to get adjusted, and looking for the right time to get him into a game. 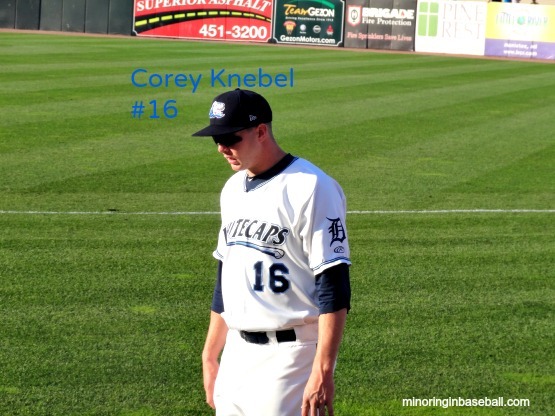 Knebel is not the first 2013 Tigers’ draft pick to get the call up (second in MLB), but he’s the first one from the last two drafts. 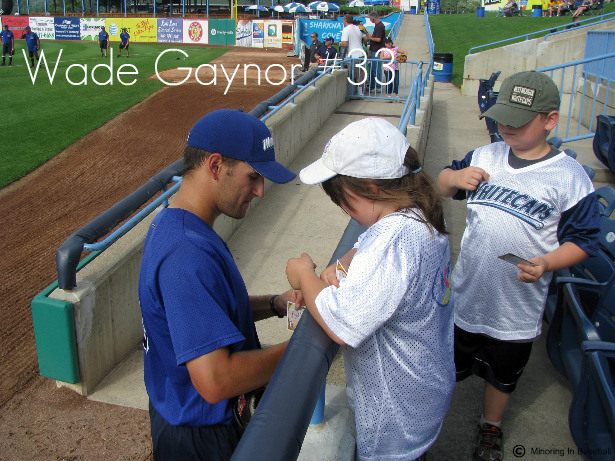 Although he was a closer at Texas, the Tigers considered him for a starting job when assigned to the minors. It’s good for him that management realized how effective he is in the late innings. 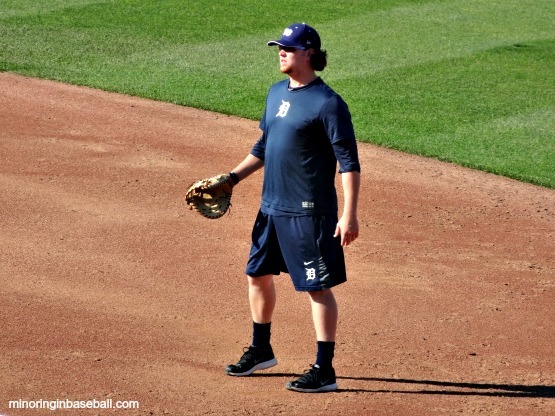 As a starter, who knows when he would have been able to earn a shot in Detroit’s rotation. To make room for Knebel, the Tigers optioned pitcher Robbie Ray back down to Toledo. We’ll definitely be watching the Tigers’ games closely for #49 to take the mound for his debut. We wont be as excited as his family that scattered to fly to Detroit from Austin, but we’re still looking forward to it. 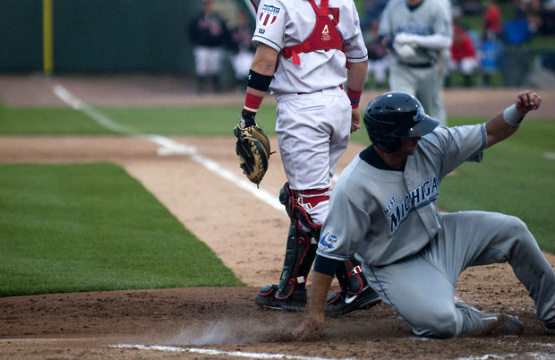 West Michigan Whitecaps vs. Lansing Lugnuts (Midwest League) Cooley Law School Stadium–Lansing, MI: Both the West Michigan Whitecaps and the Lansing Lugnuts missed the playoffs this season, but ended 2013 with their in-state rivalry. 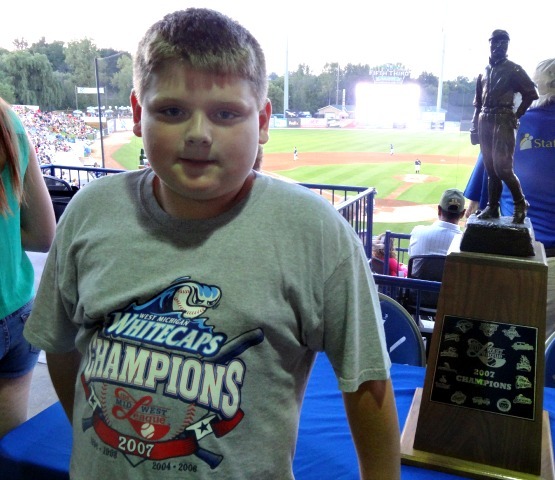 Despite the ‘Caps having a better record this season, the Lugnuts have had their number, and that includes taking 2/3 in the final series. 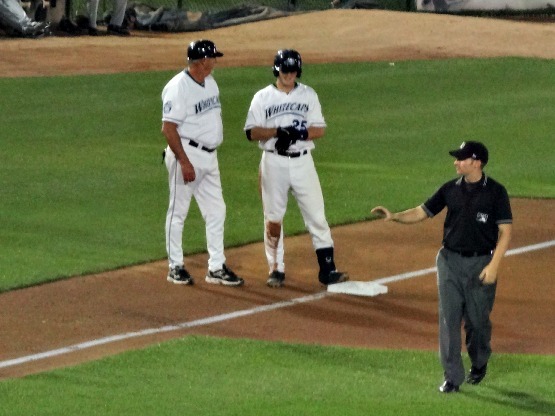 In the first game, the Whitecaps made a gallant come-back attempt, only to lose in a walk-off in the ninth. 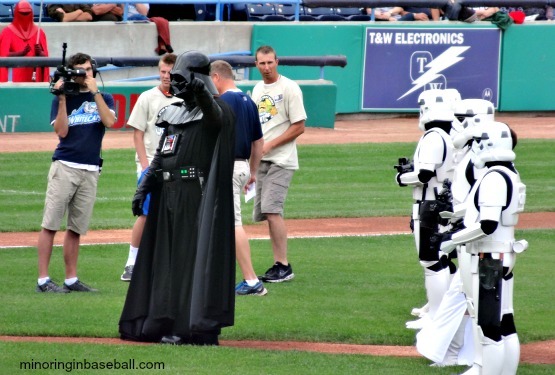 Jake Stewart and Bennett Pickar hit back-to-back singles, when the Lugnuts brought in Arik Sikula to close the game. Sikula threw a wild pitch and had a passed ball, though, that scored Stewart. 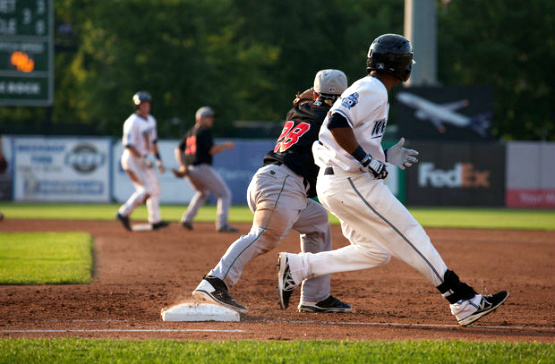 Then David Gonzalez hit a triple, scoring the pinch-runner Harold Castro to tie the game. 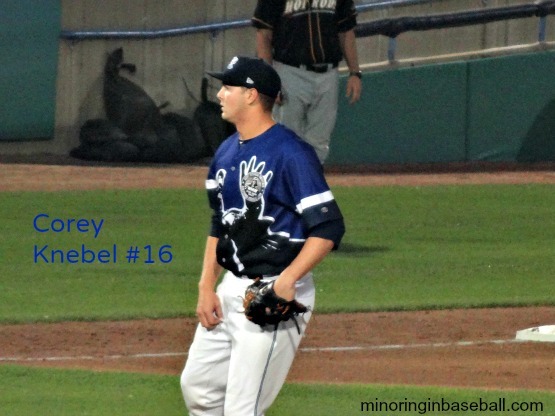 The ‘Caps celebration was short-lived, however, as a walk and two singles gave Lansing the win, and Corey Knebel his only loss of the season. 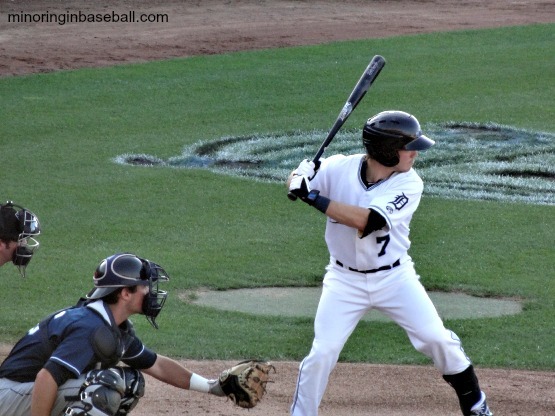 Kevin Patterson hit the winning RBI in the 5-4 win for the Lugnuts. 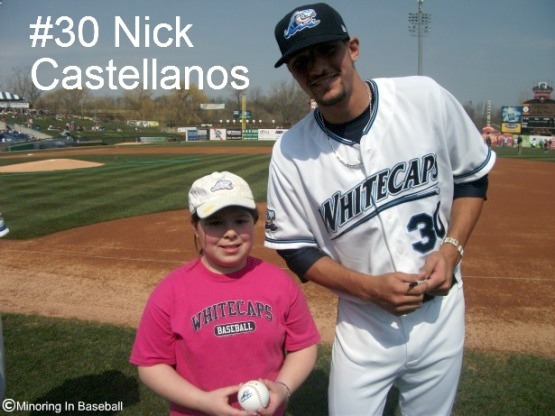 The second game of the series was a complete rout for the Whitecaps, winning the game 13-1. 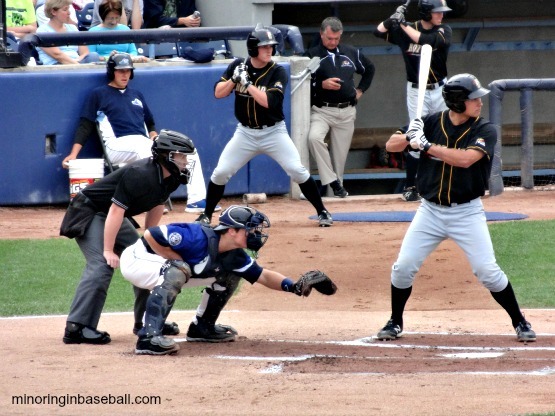 The ‘Caps scored five runs in both the third and fourth innings, one in the sixth, and two in the eighth with 19 total hits. 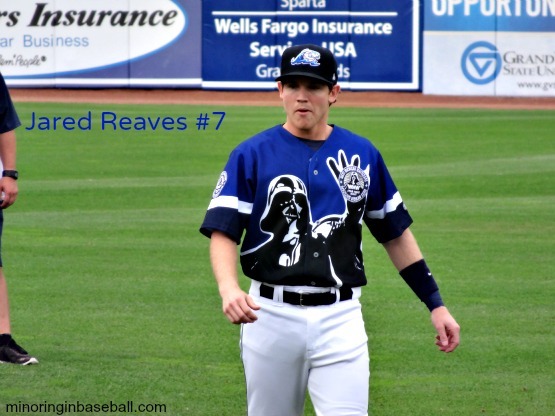 Jared Reaves led the way going 4-6 with an RBI and two runs scored. 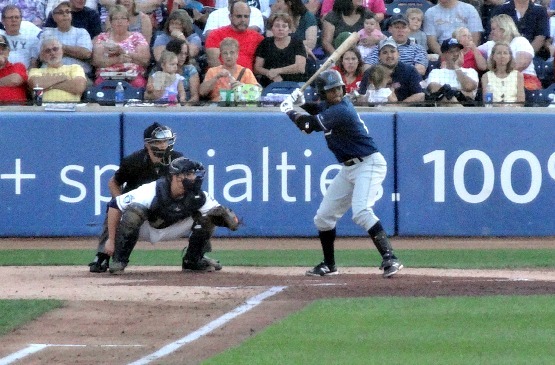 Raph Rhymes went 3-4 with a double and two runs scored. 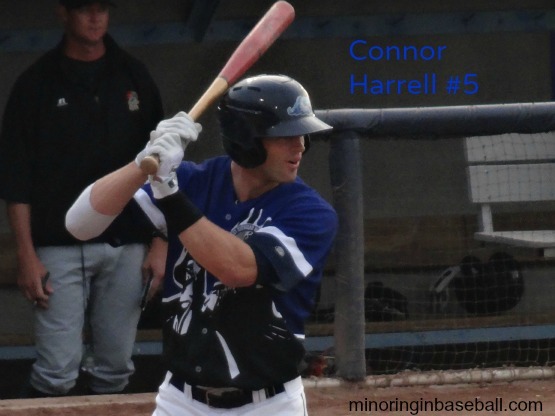 Connor Harrell and Jake Stewart each contributed with three RBI’s each. On the mound, West Michigan was just as dominant. 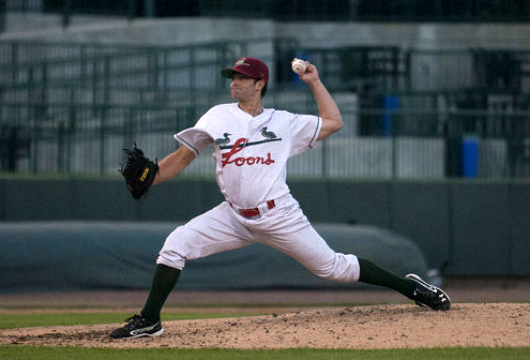 Calvin Drummond earned the win, going five innings, giving up only three hits, and striking out four. 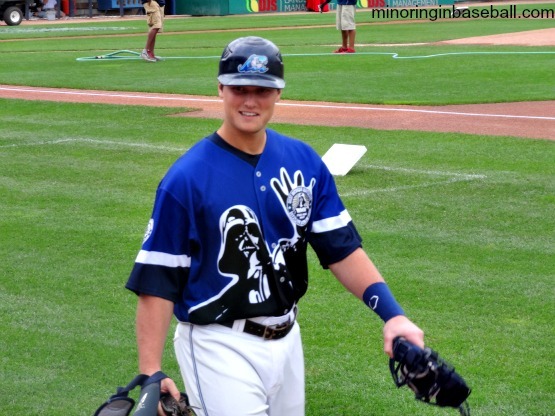 Kramer Chaplin took the loss for Lansing. 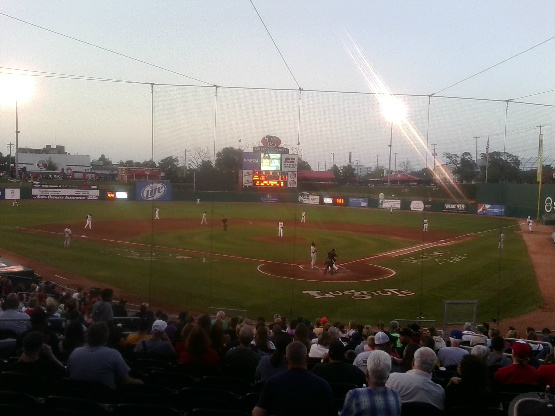 The final game of the series, and of the season, went to the hometown Lugnuts by the score of 9-4. 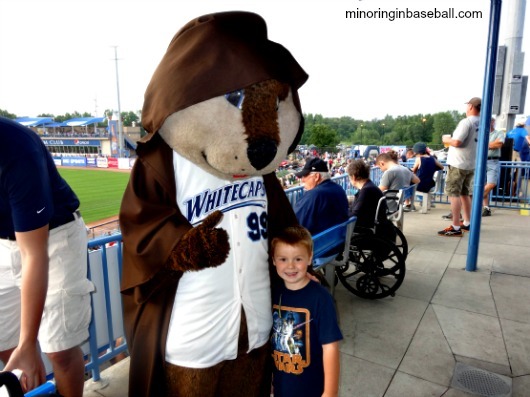 The Whitecaps had a 4-0 lead at one point, but surrendered nine streight to the ‘Nuts. 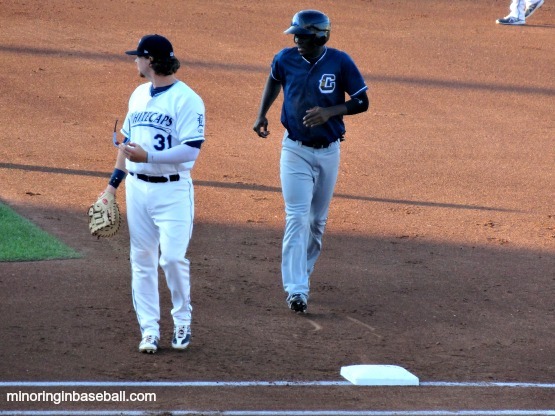 Jeff Holm, Pickar, Castro, and Jason King each had two hits in the loss. 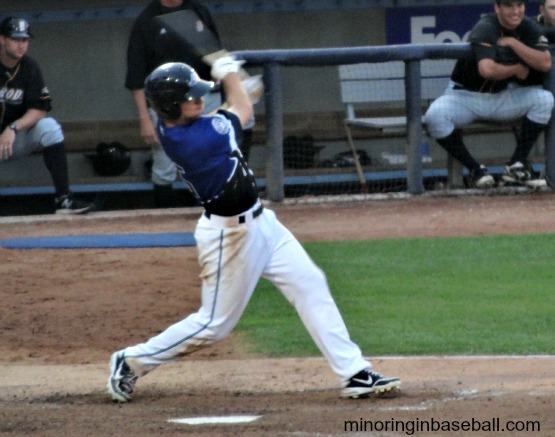 Daniel Klein led the way for Lansing, going 3-4 with two doubles, two RBI’s, and a run scored. 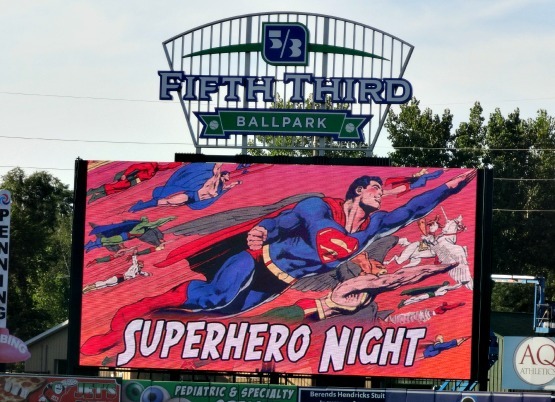 Relief pitcher Yorfrank Lopez took the loss, giving up six hits and five runs in just over an inning of work, while Ian Kadish earned the win for Lansing. Lucky for me, I had a buddy from work attend one of the games and get this photo for me. 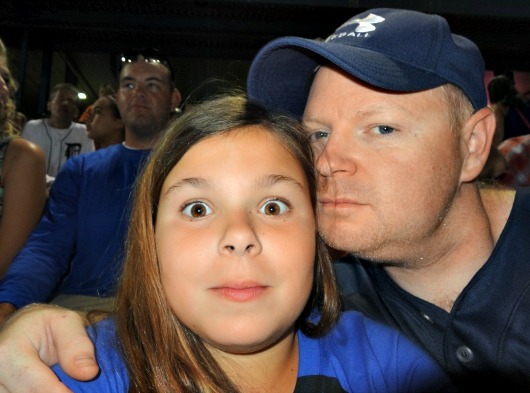 It will be a long nine or so months before seeing baseball again for sure. 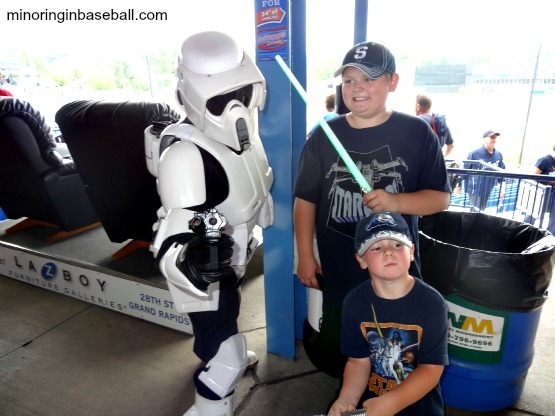 We’ll try to get to Lansing next season of the weather cooperates, and we’ll hit a few Whitecaps games for sure, including the Midwest League All-Star game hopefully. 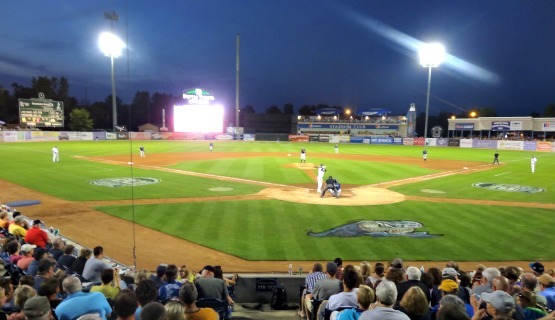 Fifth Third Ballpark-Comstock Park, MI: Back, again, just north of Grand Rapids for our last Whitecaps game of the season. A very bitter-sweet moment, but so much going on at this game, I’m not sure where to start. First, Brian was happy they had a ‘bounce castle’ set up in the parking lot. We didn’t have much time for him to play, but he still was able to bounce around for a little while before we made our way into the stadium. 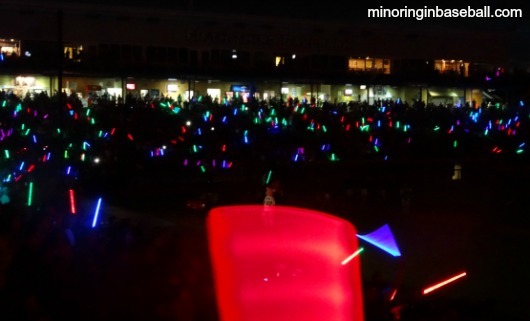 Upon entry, each of us received a free mini-bat, to commemorate the ‘Caps 20th season of play. Brian has been collecting the bats lately, so more for him. 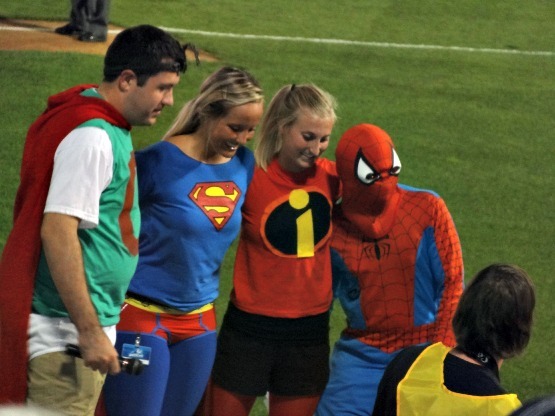 It was super hero night at the ballpark, just like in Battle Creek last month, but the only ones dressed up were the Whitecaps’ on-field staff. Still, some of them has some cool outfits. 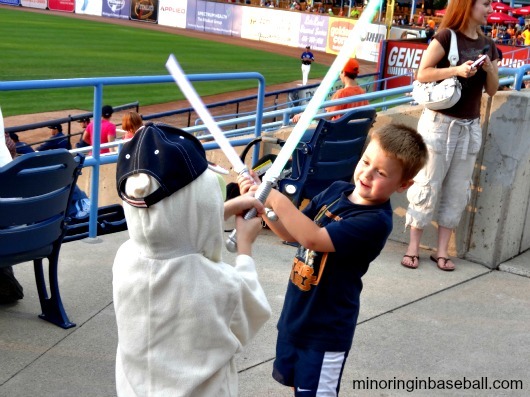 We were at the ballpark early, so we saw the Captains take some batting practice, and waited for the home team to hit the field for their warm-ups. 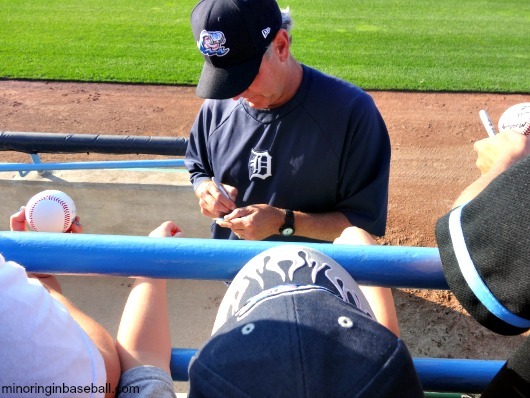 We went down to field level, where we met former Tigers’ relief pitcher, and current ‘Caps pitching coach, Mike Henneman. 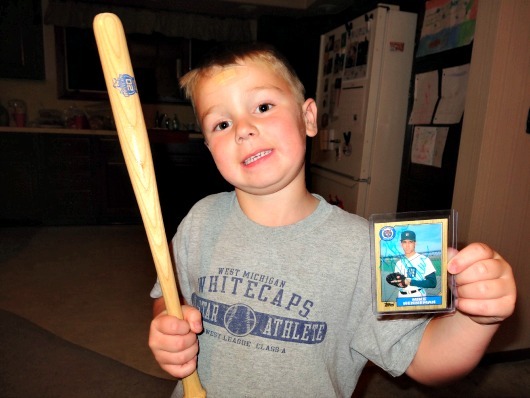 He was nice enough to sign a baseball card for Brian (a future hurler, himself!). 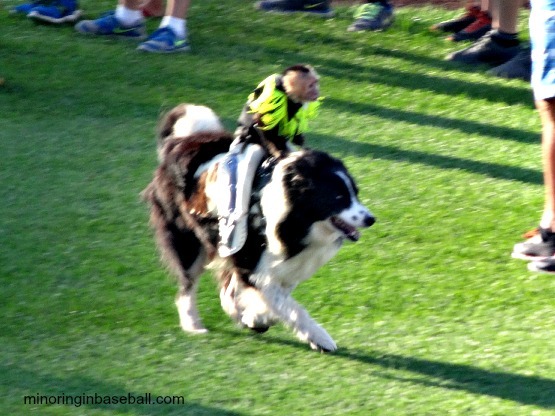 Before the game got underway, we were also entertained by team Ghostrider: basically monkeys riding around on dogs. 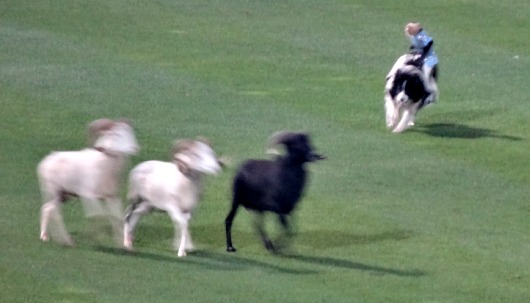 They would appear a few time throughout the game, herding goats and riding away. When monkeys act like cowboys, everybody wins! It didn’t take the kids long to get hungry, and Lily, Brian, and their Papa stuck with traditional hot dogs. Trevor and I, however, wanted to try the Baco! We made our way through the concourse, and with a sold-out crowd we were moving slowly. 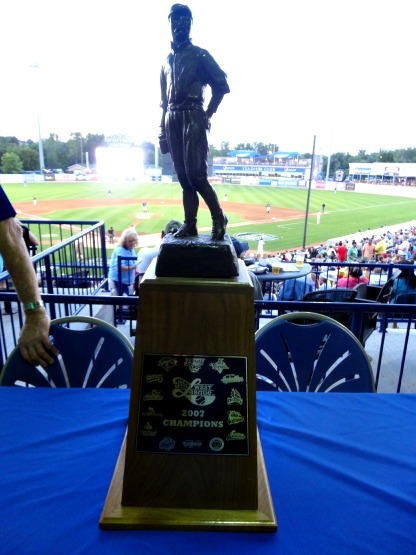 We took a break, though, to check out the Whitecaps 2007 Midwest League Championship trophy that was on display. The team was also celebrating the championship during this game, too. We finally made it to the other side of the ballpark to get our Bacos. Trevor didn’t care for it too much, but I thought it was pretty good. Not worth $6 each, but had to do it. 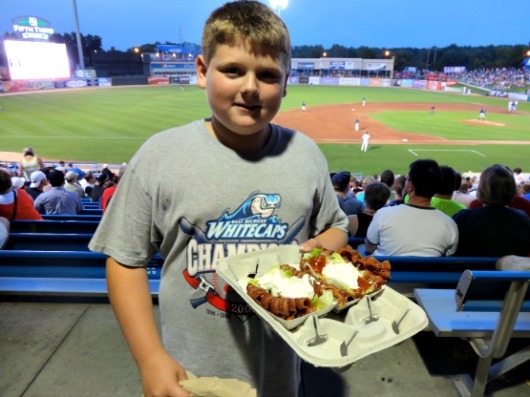 Unfortunately the Whitecaps has some of the slowest concessions ever, so we missed a good chunk of the game waiting in line. We decided to head back to our seats through the lower bowl, which was a good idea because Trevor got a foul ball that bounced our way. We were finally able to sit down and enjoy the rest of the game, which was a good one. The ‘Caps also provided post-game fireworks that the kids really love, too. 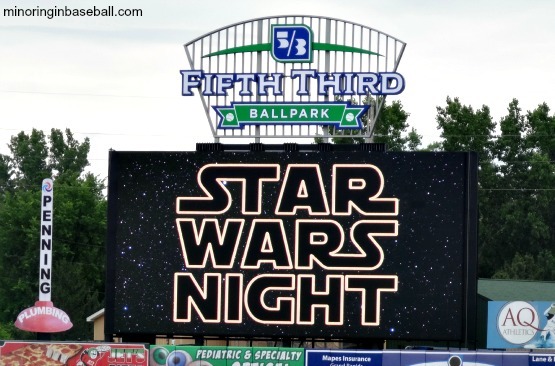 It was a hectic night all around, and sold-out crowds will do that, but still hard to wrap my head around the fact it will be a minimum of nine months before I’m enjoying baseball at Fifth-Third Ballpark again! Like I stated, the game between the ‘Caps and the Captains was a good one. 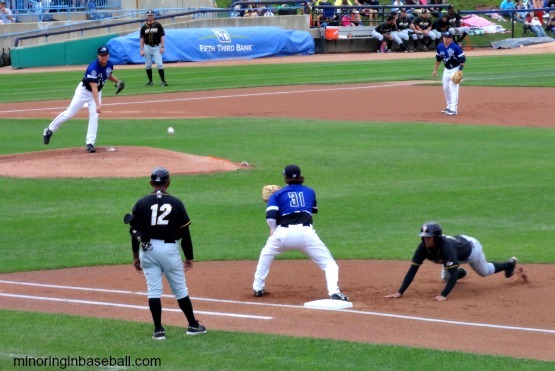 West Michigan was down 2-0 in the third, but busted out for three runs of their own in the bottom of the inning. Connor Harrell and David Gonzales started it off with a pair of singles, then Lake County started walking some batters. 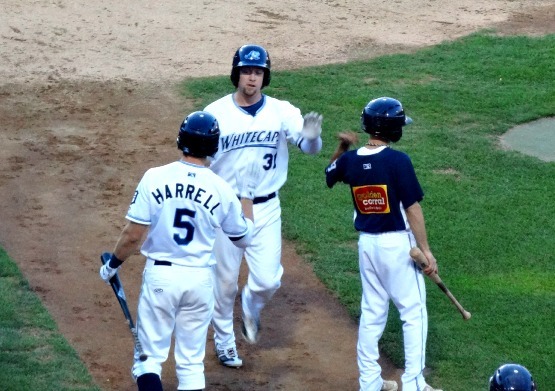 The Whitecaps scored two runs on walks, then Jason King hit a sac fly for the third run. In the fourth inning, Jeff Holm hit a solo shot to put the ‘Caps up 4-2. 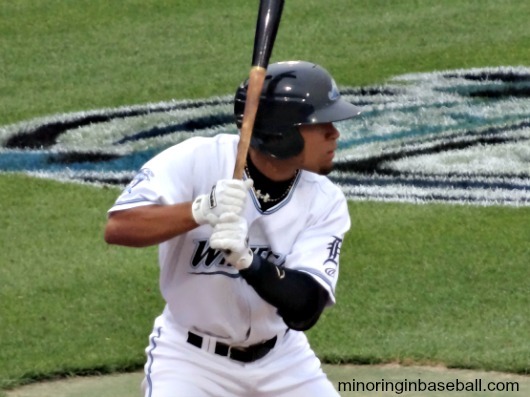 West Michigan concluded the scoring in the eighth inning, when Lance Durham hit his team leading 14th home run, after King singled. 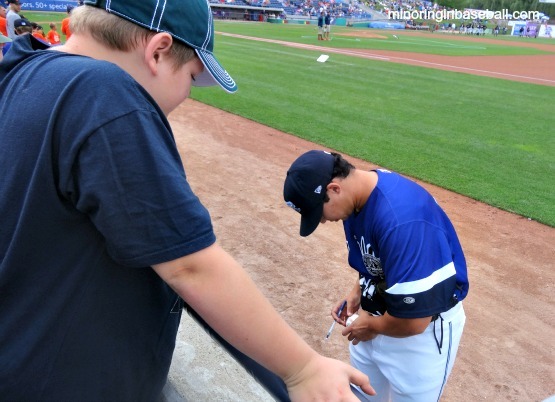 On the hill for West Michigan, Edgar De La Rosa pitched a solid game, only giving up the two runs in six innings of work. 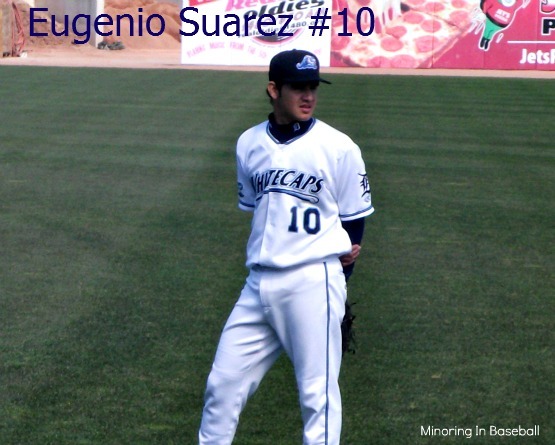 He struck out four and didn’t walk any of the Lake County hitters. The bullpen finished the job, throwing four shutout innings, with Corey Knebel closing the door in the ninth. Holm lead the offense going 2-4, and Gonzalez went 2-3. 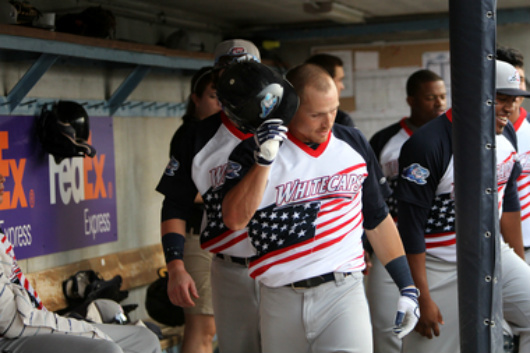 Final Score: Whitecaps 6, Captains 2. 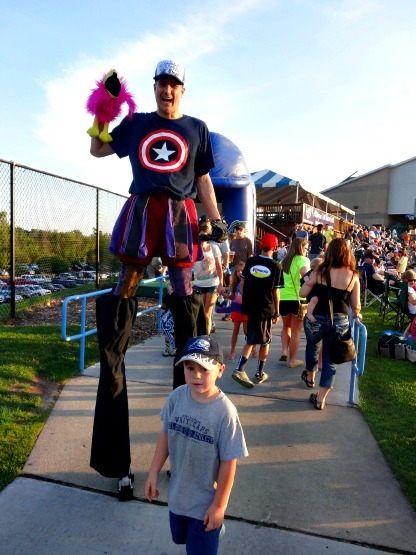 Stilt-walkers were on hand, too! The little guy with his souveniers. 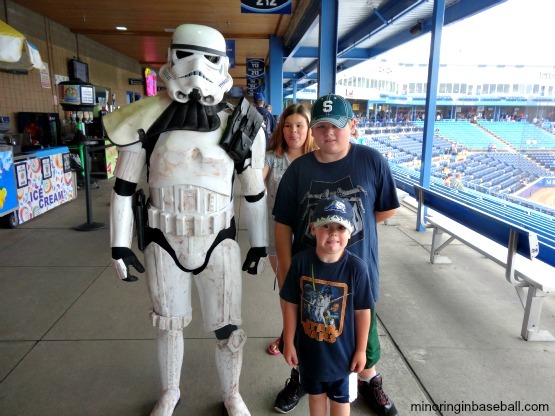 Fifth-Third Ballpark–Comstock Park, MI: It’s that time of year again, when myself and the little nerf-hearders head down to Star Wars Night. 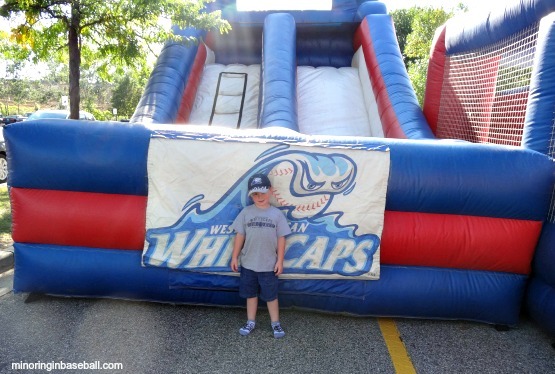 This year, we were back at the Fifth-Third Ballpark, with the Whitecaps as our host. Despite the weather report calling for rain, it all held off and it was a beautiful night. 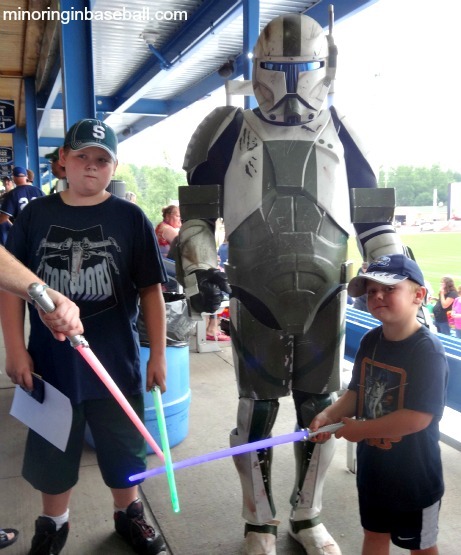 The kids were able to meet all of their favorite Star Wars characters, and some of the guys in the suits were pretty darn funny. 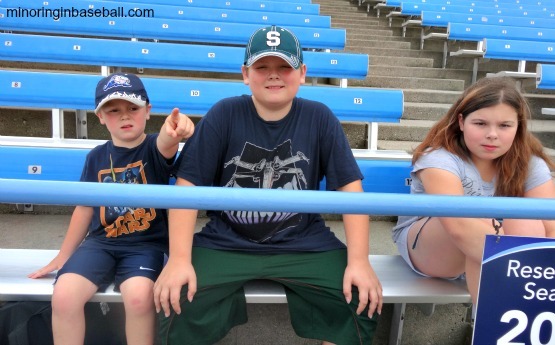 They kept the sold out crowd entertained until the game started, and were more than happy to pose for pictures for the kids. 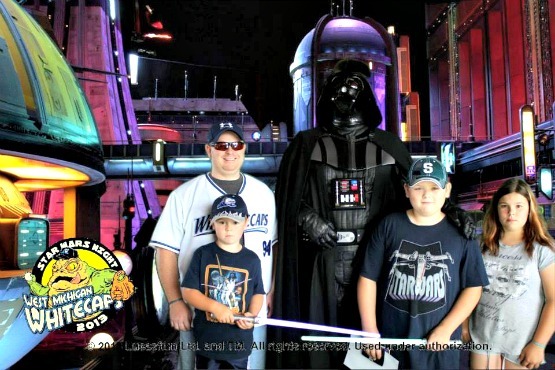 This was one of the best Star Wars nights we’ve been too so far. 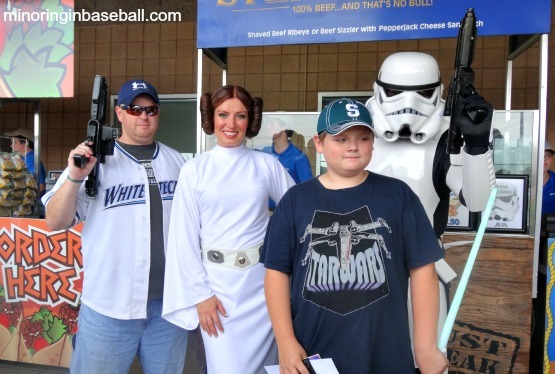 We tried for some Whitecaps autographs, but got very few as the players didn’t walk by the fans due to the Star Wars guys. 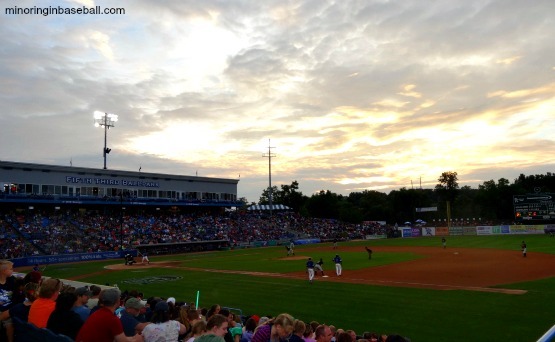 As for the game itself, it was another dismal one for the Whitecaps. They’ve had a tough time offensively ever since Devon Travis was promoted. DH Lance Durham did go 2-4 on the day, however, but short stop David Gonzalez was the only one able to strum up an RBI. 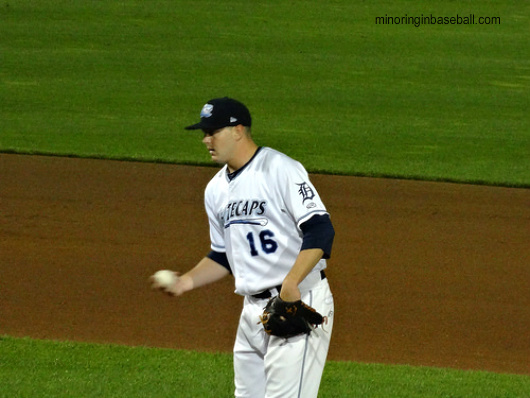 Chad Smith took the loss on the hill for West Michigan, giving up only two earned runs, though, and striking out three. Corey Knebel came in for the ninth inning, and stayed perfect so far since joining the ‘Caps. 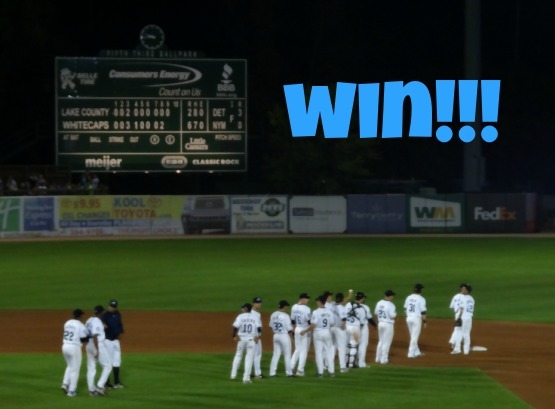 Final score: Whitecaps 1, Hot Rods 3. 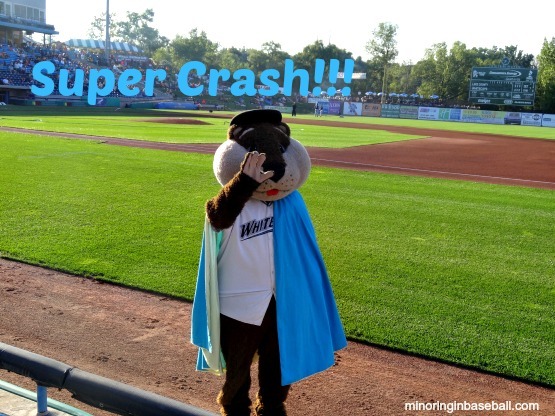 Brian with our favorite mascot-Crash the River Rascal! 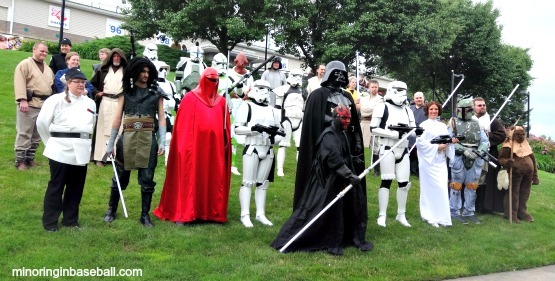 Brian found some fellow Jedi to duel with! 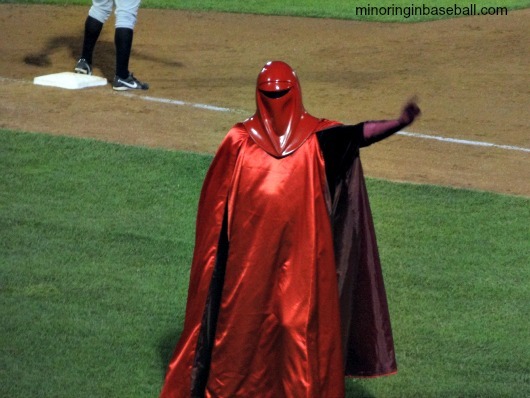 An Imperial Guard doing the YMCA!